70's influenced rock music, reggae and ballads. High feel-good factor with plenty of "tongue in cheek" humour. Influences - Status Quo, Deep Purple, Police, Bob Marley, Thin Lizzy & Beatles. 1. So, Where's The Party? 6. What Crap is That? Formed in 1994 as a four piece guitar-based rock outfit, BEDROCK have thrived over the years since then. Living in an isolated hamlet in the Namib Desert they ply their trade up and down the Namibian and South African west coasts, gigging consistently. They have released three albums to date - the first was a collection of covers and the next two contained only original material written by the band members themselves. \"Rock \'n Roll Man\" from their album, RECOVERY, secured their first consistent airplay and has become something of a standard in southern Africa. Since then a number of their tracks have enjoyed regular radio time, \"Crowd Invasion\" and \"Last Round\" being examples from this album. I've never been a big fan of African Rock and Roll. In fact I can honestly say that I've never heard an African rock band did too much for me. 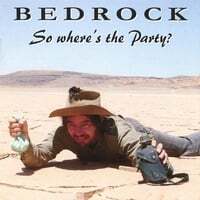 After listening to Bedrock's new album, all I can say is, "If this is what music is like in Namibia, send me to the desert."